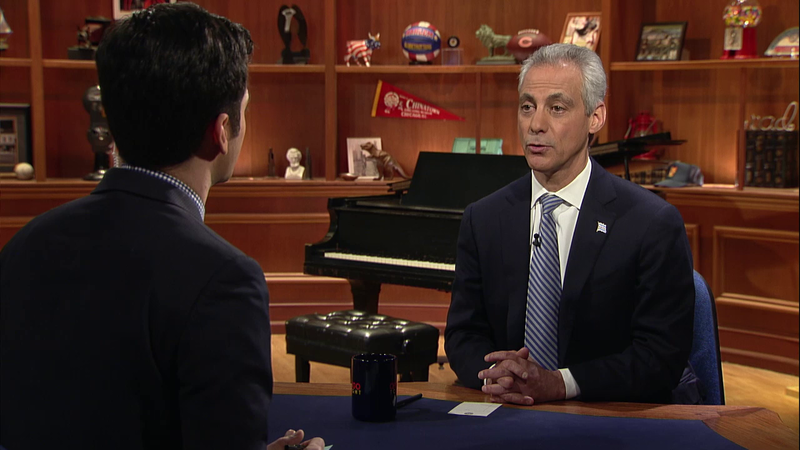 Mayor Rahm Emanuel joined “Chicago Tonight” for a one-on-one interview with Paris Schutz. There’s no shortage of topics to cover with the mayor: The new year so far has seen an increasingly bitter budget standoff in Springfield that has prevented state lawmakers from taking action on ballooning public employee pension debts and the financial collapse of Chicago Public Schools, which laid off 227 central office employees last week and could begin sending pink slips to thousands of teachers. The Chicago Teachers Union, which is currently in contract negotiations with CPS, has threatened to go on strike over the layoffs and concessions sought by the district but announced Thursday evening that a "serious offer" had been made by CPS. And while the fiscal headaches grow more severe at CPS, city officials are searching for a new police superintendent as the U.S. Department of Justice investigates the Chicago Police Department in the ever-evolving aftermath of the Laquan McDonald shooting, with questions swirling about whether a code of silence that persists in the police department exists in other branches of city government. Below, some highlights from the portion of our conversation about education. "I think it's better for me to characterize it as very good discussions, with a lot of respect on both sides for the challenges they're facing, but to try to create a win-win situation for both teachers, taxpayers and our students," the mayor said. "My general rule is to respect their process, but to know that there was a good-faith effort on both sides, to get to a point of mutual agreement. In these type of situations, I want to respect the process, respect the people who worked hard at this. At this point, less said is better." "I do believe that part of the solution is to reach an agreement [with the CTU] but a bigger part of the solution is making sure that Springfield steps up and is a partner to the changes and a stabilization of the finances," the mayor said. "Right now, without a budget, the state of Illinois has run up close to $7 billion in unpaid bills," he said. "They can't go two years like that. Both the Speaker and the Senate President have been committed–Chicago Public Schools will be their number one priority–and I'm confident we're going to get our way through to get the equity and the fairness in financing for education." "We're working towards an agreement on a contract. The last place you want financial advice and counsel is from a state that hasn't passed a budget, has $7 billion in unpaid bills, kids quitting college because they can't afford to go there. You're going to seek financial advice from there? My view: Take your energy and time as it relates to finances, get your budget done. "It's not necessary and if they have that type of time on their hands, then pass a budget," he added. "We do that every year," said Emanuel. "Of all the TIF resources throughout the city, the number one recipient is Chicago Public Schools, through construction." Watch the video to hear our full conversation with the mayor which includes city violence, police reform, credibility, state politics and more. We asked viewers of “Chicago Tonight” to tell us what questions you have for the mayor. Many of you had questions about struggling Chicago Public Schools and how to best use TIF dollars. Others asked questions about the city’s handling of police violence. On our website, Frances Camacho wrote, “In response to the State of Illinois stating they plan to take over CPS, what are some of the solutions that the Mayor and his office have proposed to ensure the quality education of our students without a state takeover?" To review all of the questions we received on our website, go here; to see questions posed on our Facebook page, go here. We thank everyone who shared their questions with us in advance of our discussion with the mayor. Emanuel most recently sat down with "Chicago Tonight" political correspondent Paris Schutz on Dec. 8 to discuss police accountability, training and use of force following the shooting deaths of two African-American males at the hands of on-duty police officers. Watch the segment below. Jan. 28: Earlier this evening, the union announced a possible breakthrough after the day's bargaining session wrapped up. Jan. 22: Chicago Public Schools today gave layoff notices as part of efforts to reduce its $480 million budget shortfall. “There’s no doubt that these cuts are painful. However, with limited resources and a budget crisis not just this year but into the foreseeable future, we had no choice,” said CEO Forrest Claypool in a release. Jan. 20: Republican state leaders want to take away mayoral control of the cash-strapped Chicago Public Schools. Instead, they want the nation's third largest school district under the purview of a state emergency board. Democratic legislative leaders in Springfield immediately opposed the plan. We speak with state legislators from both parties. Jan. 20: Chicago Teachers Union President Karen Lewis calls a new proposal by Gov. Bruce Rauner and Republican leaders political theater, as the union and Chicago Public Schools work feverishly to settle a contract deal. CPS CEO Forrest Claypool also slammed the proposal. Dec. 31: The city of Chicago’s Law Department on Thursday released thousands of internal emails exchanged between city officials regarding the fatal police shooting of 17-year-old Laquan McDonald. The emails provide a behind-the-scenes glimpse into how Mayor Rahm Emanuel’s administration reacted to the shooting that took place on Oct. 20, 2014 and its aftermath. Jan. 11: Tuesday the public gets to have its say in the search for the city's new police superintendent. Lori Lightfoot, president of the Chicago Police Board, joins "Chicago Tonight" to talk about the search.